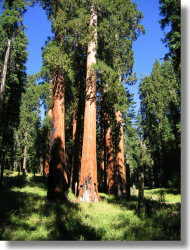 The most famous feature in southern Yosemite is the Mariposa Grove of Giant Sequoias, home to hundreds of these magnificent trees, including the 1,800-year-old Grizzly Giant. The grove is closed for restoration until late 2017, though, leaving the main hiking attractions as Chilnualna Falls, an underrated waterfall hike, and Wawona Meadow, an easy loop trail that's home to dozens of wildflower species (in season) and is one of the few trails in Yosemite where dogs are allowed. Southern Yosemite is also home to the Wawona Hotel, a national historic landmark. Dating from 1879, it's a mere 1,600 years younger than the Grizzly Giant. The aforementioned Wawona Meadow loop trail is across from the road from the hotel, and a popular swimming hole at the Wawona Swinging Bridge is a short ways down a side road here. You may also want to visit the Pioneer Yosemite History Center near the Wawona Hotel. It includes various historic buildings, a covered bridge, and a collection of stagecoaches. The historic Wawona Hotel has 104 guest rooms, half with private baths and most opening onto verandas. It's been entertaining distinguished guests since its completion in 1879, when Ulysses S. Grant stayed there. It's seven miles (11 km) from the Mariposa Grove and across the road from Wawona Meadow and a 9-hole golf course there that predates the area's incorporation into Yosemite. There's free bus service from the hotel to the grove in the summer (or there will be when the grove reopens, anyway). Fish Camp, two miles (3.2 km) outside the southern entrance, has a handful of small inns; the not-at-all-small Tenaya Lodge, an all-purpose lodge with spa facilities and a variety of hosted activities; and the Narrow Gauge Inn, which has its own antique logging train. 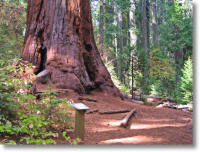 The sprawling Wawona Campground (100 sites) is just up the road from the Wawona Hotel and Meadow. Summerdale Campground is a mile outside the park, between the south entrance and Fish Camp. Both require reservations and fill up quickly in the summer. Summerdale is closed winters; Wawona is open year-round. There's a restaurant at the Wawona Hotel and a mini grocery round the corner from it. In Fish Camp, there are two restaurants in the Tenaya Lodge and another at the Narrow Gauge. Available at Wawona and in Fish Camp. * For hikes that have more than one possible route, this table lists distance and elevation for the shortest route. Or the longest one. Whatever seemed the most useful at the moment. Listed distances for all hikes are round trip. * Hikes with an asterisk have more than one possible route. Listed distances for all hikes are round trip.